Spectacular Oceanfront home with 180 degree View!!! 4 bedrooms, 3 baths, (sleeps 8) - One Level - Amazing Oceanfront Views! 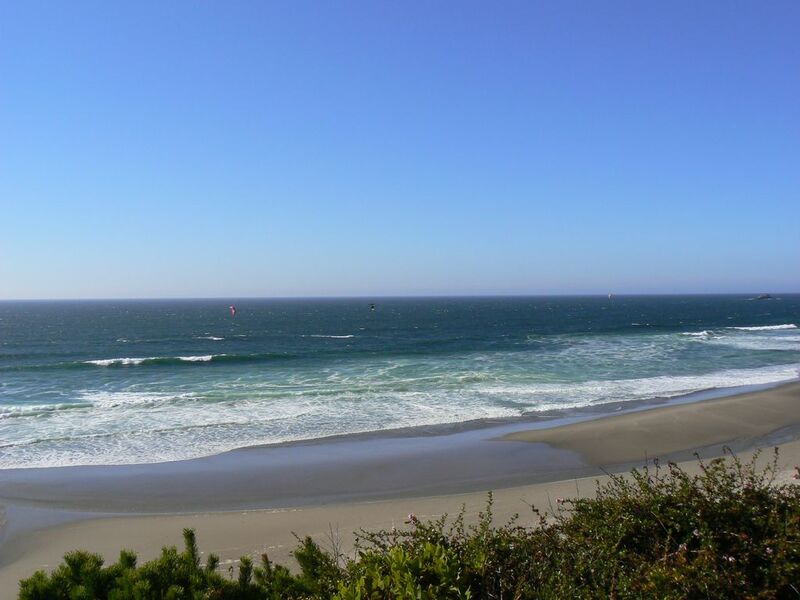 Located in the popular Road's End neighborhood, north of the casino with true 180 degrees of the Oregon coast. Listen to the waves at night, and breathe the fresh salt air from the ocean during the day. If you want a really comfortable beach house with a huge view, this is it. Our home is about 45 feet directly above the beach. This affords our home amazing views up and down the coast and beach, just look at our photos online. Take a short walk (2 minutes) to the beach for walking, horse back riding, kite flying, and tide pools. In winter, sit back and enjoy the amazing view of waves crashing on the beach and storms rolling in across the Pacific. In summer, just enjoy the sunshine from your deck on the ocean. We of course offer free WiFi and Large cable Flatscreen TV and Blu Ray player. The spectacular Oregon coast is right out your windows in the Living, Dining, and Master Bedroom. There's a stone fireplace in the living room with plenty of firewood supplied. Walls of windows and open beamed ceilings add to the beauty. The kitchen is supplied for a cook...much more than the typical vacation home. Master bedroom has a king sized bed with attached full bathroom. Fourth bedroom has built in, highest quality, full twin size bunk beds. Pets are limited to no more than 2 well behaved dogs. My family has managed vacation homes on the Oregon coast since 1999 and we take pride in providing a high quality home for our guests. When you open the front door to our home you will be greeted to the amazing ocean views that we first fell in love with over 15 years ago. We take pride in equipping our home just like it were our own. Located right above the beach this home enjoys amazing 180 degree views! Located right above the beach, with an uninterrupted view of the ocean and beach. WiFi - high speed cable internet. Dining table for up to eight, with amazing ocean views. Flat screen in the master bedroom as well. iPod docking CD and Radio for the living room. Enjoy your iPod or iPhone. iPod docks also available in the master bedroom and second master. This home is all on one level. The living room, kitchen, dining room and master bedroom all look right out to the ocean. There's a fenced yard for a dog. The garage is attached to the house. Firewood is provided. BBQ is stainless steel LP gas. A great deck runs the width of the house. We had a 3 night visit to Greg's home in Roads End. We were celebrating my Mother's 91st birthday and needed to find a one story home with ocean view. This house was perfect for us. You are right on the ocean. I walked in the morning for several miles and it is a short walk to the beach entrance. The kitchen is well stocked- even had a salad spinner. There were 7 of us so there was plenty of seating at the dining room table and in the living room. It was nice to have a fire place with wood. The bunk beds were a little daunting for us in our 60's but we managed. Sister in law slept on the couch in the living room and was very comfortable. We will definitely return to Greg's house when we visit Roads End again. The house was great! Location was great! Looking forward to the next time. This cozy and comfortable home has wonderful views that I could sit and enjoy forever. The kitchen was stocked well with all the basics we needed for cooking as well as plenty of paper products, which always seem to be a problem in rental homes. The 4 bedrooms and 3 bathrooms fit our multi generational group perfectly. The home's fully fenced front yard was great for our pup. It is a bit of a walk to get to the beach access, so when we went down to the sand, we planned on staying for a few hours at a time. Overall this home was great and we'd definitely recommend it! Relazing stay at a great location. The property is ideally located on the beachfront and has spectacular views on clear days. Even when the weather is not clear it is still great. The house has everything you would need and is only a short drive (or walk) to shops and restaurants. We didn't need to use the fire while we were there but I am sure it would only serve to make the place cosier and more welcoming. We would definitely stay there again and recommend this to anyone (families or couples). The owners clearly love this home and it shows in the way it is presented. Posting may not have been clear about beach access; the house is about 2 blocks from the Road's End wayside, where there is a path to the beach. We knew we'd want to barbecue, and we've had mixed luck with BBQs at rental homes, so we brought our own weber. Good thing, because the gas BBQ at the house was dirty and not functional. While location and views are good from the deck, the shrubs have grown taller than the deck, making it so we could not view the ocean while sitting on the deck, only while standing. With those few drawbacks, the house was well stocked and comfortable. Rates are subject to change without notice until confirmed. A completed Rental Agreement must be returned within 10 days of booking to confirm your reservation. The Rental Agreement will be provided as part of the reservation process.